...but above 100 and 200 hour MA. 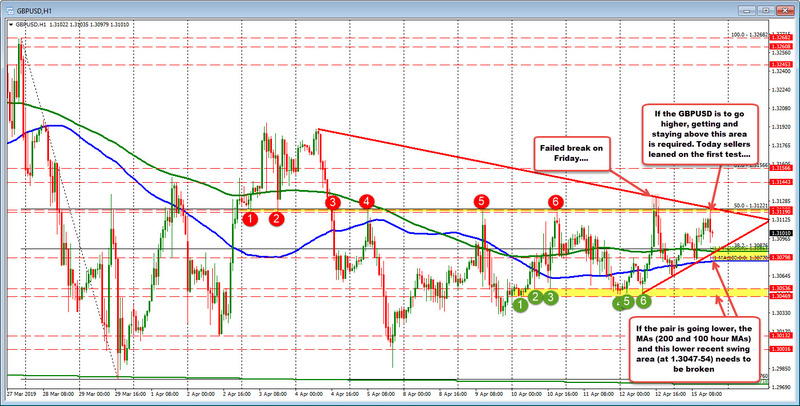 The GBPUSD is higher on the day. However, the pair did seem to run into some overhead resistance that has tempered the buying. The high price reached 1.3119. That was near swing levels and the 50% midpoint of the move down from the March 27 high to the March 29 low (at 1.31221 - see top yellow area in the chart above). If the GBPUSD is to go higher, getting above and staying above will be needed (from a technical perspective). On Friday, that exact break was tried but failed. The old ceiling was reestablished today. More bearish. On the downside, the 200 and 100 hour MAs at 1.3077 and 1.3085 respectively to push the bias more to the downside. Below that, the 1.30469-536 was a more recent swing area (from Wednesday to Friday last week). Those are the downside targets now.